5x 128Kb 28-pin DIP 12ns cache chips (not working since the board only supports 20ns and 15ns SRAM chips). 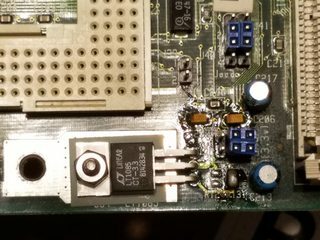 Granted my soldering isn't that great, but, it has improved, and thankfully, I still have a ton of flux left and a few wrapped up solder braid, which did get the old solder off in order for me to install the voltage regulator. The battery holder that's installed got a lot of the flux cleaning chemical on there, so I'm going to replace it with the spare I bought and the system says the battery is dead and the one thing I wish I had was a 3.3V DX4-100 processor to make sure I got the connections set and that the voltage is spot-on and adjust the soldering if necessary. 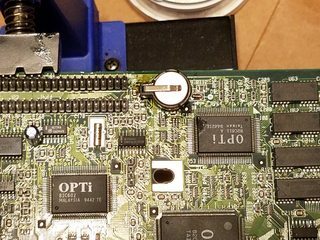 I put the spare battery holder on last night after running errands and found out later on that the battery jumper header was missing the jumper on pins 3-4 (fortunately, I had plenty of spare jumpers), and it now keeps the settings. Got to tell you, modding this board was icing on the cake. The dual floppy drive was acting cray last night (the PC speaker was beeping erratically) as it might need lubrication or a good cleaning of the rails, but, I sent a DIR A: and DIR B: command when I booted into MS-DOS safe mode (safe.bat) with or without a diskette in the drive(s) and it did move freely and the drives were seeking without any more issues when I power cycled the desktop. Also, the L2 cache is still a mystery (will boot the drive, but, it just sits there), however, it gets detected as 128KB since the chips are 4x 32Kx8 20ns 28 pin DIP, 1x 32Kx8 15ns 28 pin DIP, and 1x 64Kx1 15ns 22 pin DIP. Maybe it has problems because of the different speed grades of your cache chips. Try it with only 128k (4x32k). I made a mistake at the beginning: the L2 cache chips are 256Kb (32Kx8). The only thing I need to do is run the BIOS upgrade diskette to clear the issue: CMOS battery "dead" error. Other than that, it works and I'll be surprised if my L2 cache works in the system. Ran the BIOS upgrade successfully and it's not complaining about the "dead" battery. I forgot to add this string: I=e000-f2ff to the emm386.exe line in the config.sys file. Also, I swapped the 32x Apple CD-ROM drive (Matsushita) with the Creative Labs CR-563-B 2x CD-ROM drive for better period correctness on Friday night, read CDs without an issue, but, it wouldn't eject unless I use the manual eject method. I set it off to the side until Saturday evening for diagnostics, and when I looked at the eject mechanism motor, there was corrosion on it and the tray would barely eject (slow to eject and slow to close the tray). I ended up replacing the motor with the one I removed off of a broken CD-ROM drive that lost its laser due to a broken/shattered disk that was in there, and it's fully functional.